A few days ago in Why the Fermi paradox must be taken seriously I attempted to demonstrate that the technology of any peer civilizations extant in the Milky Way would have singled out the earth as an interesting place to visit and thus would likely have made us the target of alien exploration if advanced peer civilizations existed in the Milky Way. I neglected to mention that, to a certain extent, this applies even to nearby galaxies, although the farther away the galaxy we reference, the more difficult it would be to obtain the scientific knowledge of the earth at a distance, and the more difficult it would be to travel. But difficulty is not impossibility, and if we contemplate the possibility of very old peer civilizations in the universe, their technology would be so advanced that the difficulties would be reduced. It is one of my dissatisfactions with most books on astrobiology, exobiology, SETI, and space travel that they implicitly confine their scope to the Milky Way galaxy without explicitly acknowledging this restriction. Of course, the Milky Way galaxy is a very big place, but in the several posts in which I have referenced the Hubble Ultra Deep Field Image (which has been called “the most important image you will ever see”), when we consider the universe on a very large scale, galaxies fill the sky like the familiar stars filling our night sky. 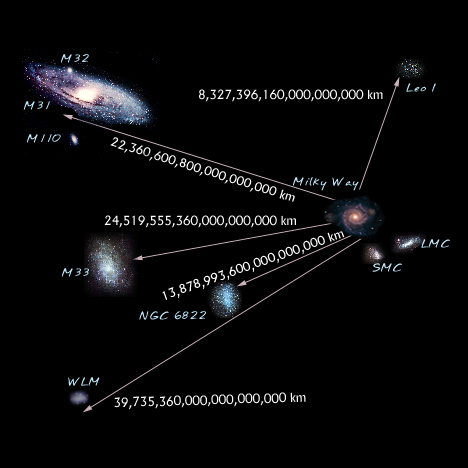 The Milky Way is a very big place, but the universe is a much bigger place, and we must understand the Milky Way in the context of the universe. The nearest large galaxy to us (excepting the Magellanic Clouds) is the Andromeda Galaxy, which is an elegant spiral galaxy larger than the Milky Way. In the fullness of time, the Andromeda spiral galaxy and the Milky way galaxy will collide, the supermassive black holes at the center of each galaxy will eventually merge, and a new and even larger galaxy will be born from the collision. But that will be a very long time from now. In the meantime, the Andromeda galaxy is about two and half million light years from us. That means that any observation of the earth from Andromeda would be two and a half million years old. While this is a long time ago for us, in geologic terms it is not all that long ago. While a peer civilization in the Milky Way would experience a lookback time of not more than 100,000 years, bringing observations to the time of the emergence of homo sapiens, the lookback time from the Andromeda galaxy would bring the observer back to a time when several hominid species were ranging around Africa. This corresponds roughly to the time of the emergence of homo habilis and the beginning of tool use among hominids. While this time scale means a lot to us, the biosphere then and now is almost identical, and to an advanced peer civilization then and now on the earth would look pretty much the same. The earth would still be positively brimming with life and therefore a very interesting place to visit. Assuming only advanced technology and no exceptions to the laws of physics, a starship launched from the Andromeda galaxy would take at least two and a half million years to arrive, but due to time dilation at relativistic velocities, hardy explorers could make the trip in a single lifetime. Somewhere I read (I can’t recall exactly where) that a starship accelerating at the relatively modest rate of 32 feet per second (which has the added value of providing artificial gravity onboard) would only experience about 24 years of elapsed time on the ship during a voyage between Andromeda and the Milky Way. If we were to combine this sort of feasible travel technology with induced hibernation, it is entirely plausible that a group of explorers could travel between galaxies. And the closer one approximates the speed of light, the greater the time dilation, so for explorers there would be a strong incentive to “push the envelope” as it were. Again, this involves some very advanced engineering, but it doesn’t violate any known laws of physics, and the technology involved is at least comprehensible to us, even if we aren’t in a position to build it ourselves any time soon. Now, you might ask why anyone would leave behind their world by two and a half million years in order to go to another galaxy. In the books I have been reading lately I have found that several authors are remarkably sanguine about this, and confidently predict that robotic exploration would be so much more preferable to actual exploration by conscious agents that the latter possibly is simply set aside. For example, I have found this more or less to be the implicit viewpoint of Timothy Ferris in Coming of Age in the Milky Way, of Michio Kaku in The Physics of the Future, and of Paul Davies in The Eerie Silence. I don’t buy this at all. Just as there are, in our contemporary civilization, many people who enjoy the comforts of home, there are always a few people who climb mountains. And, similarly, when the technology is available, many people will continue to enjoy the comforts of home, but there will always be those who are so driven by the need to explore that they will leave behind home and family and indeed the entire world that they know in order see to what lies beyond the horizon. It is perfectly reasonable to me that a group of explorers might choose to leave behind the Andromeda galaxy merely for the purpose of investigating an interesting planet in the Milky Way. In fact, I might choose to do this myself, were it a viable option. As we consider galaxies and possible peer civilizations at a further reach, beyond the local group and the local cluster of galaxies, the possibilities of relativistic time dilation continue to make exploration possible on an inter-galactic scale, but it would become much more difficult to find interesting planets at this distance, even with techniques like gravitational lensing. However, as we have seen, difficulty is not the same thing as impossibility. However, another factor comes into play as we move further away from the Milky Way. While those on board a very fast intergalactic starship (approximating while never achieving the speed of light) would experience very little time, time outside this starship would elapse at the accustomed rate, and that means that the more distant the galaxy, the longer ago in time a ship would have to have been launched. The problem with this, and the problem with much SETI research, is a failure to engage with the anthropic cosmological principle, which seems to be concerned with human existence, but is equally valid (in its valid forms, that is) for any organic conscious agents that emerge according to the laws of nature and natural selection. The farther away we consider, the further back we go in time, and the further back we go in time, the less the universe has evolved toward its present state. At much earlier states of cosmic evolution the elements requisite for peer life, and most especially for peer industrial-technological civilizations, simply do not exist. A solar system that could support peer industrial-technological civilization would have to have formed after the heavier elements had been formed inside stars from earlier stellar populations, since the only way you can get elements like iron and uranium from an initial stage of hydrogen is, over the course of galactic evolution, for these elements to be cooked up inside successive generations to stars, and then ejected into the universe by way of supernovas. These elements then go on to form solar systems that include the kind of metals that are required for industrial-technological civilization. This takes many generations of stars. As a result, if you have far enough back in time, you arrive at a time before these generations of stars have elapsed, and therefore the conditions for peer civilizations do not exist. There is a cosmological window in the natural history of the universe for industrial-technological civilizations to emerge. We cannot yet state with any precision how long this window persists, or when it starts. Almost certainly there could be peer civilizations a million or more years old in the universe, but somewhere there is a limit older than which a civilization in our universe could not be. Thus when SETI researchers confidently speak of civilizations millions years old, I am immediately skeptical. It is not impossible, but the further back in time you go, the less possible it becomes. It is worthwhile to think about this in more detail, as it also has consequences for the Fermi paradox. If we regard it as a mere matter of chance when an industrial-technological civilization emerges from its organic origins — which, it seems to me, is something we must acknowledge in the spirit of methodological naturalism — then it is just as likely that our civilization just happens to be to first such to emerge in the Milky Way, on perhaps even in the local group of galaxies, as it is that we are not the first. Of course, this is not a function or mere chance — it is chance constrained by the anthropic cosmological principle, as well as chance constrained by natural selection. But this is only a rough formulation. An adequate formulation would take more time and more thought.